The ironSource Mediation platform now supports Interstitials, the industry’s most popular ad format! The Interstitial Mediation solution is easy and simple to integrate within the ironSource SDK and optimizes user experience, fill rate and eCPM. * Invoked when Interstitial initialization process completes successfully. * Invoked when Interstitial initialization process is failed. * @param supersonicError - An Object which represents the reason of initialization failure. * @param supersonicError - An object which represents the reason of showInterstitial failure. The onInterstitialOpen event conveys the ad format has takes over the app screen but does not indicate that an ad has been successfully served to your end-user. The onInterstitialShowSuccess event conveys an Interstitial Ad from ironSource or any other ad network was successfully served to your end-user. You should initialize the Interstitial Ad Unit as early as possible to allow time for the Interstitial to load. We recommend doing so on app launch. “this” is the activity in which the Ad Unit should be presented. mAppKey is the unique ID of your Application in your ironSource account. mUserId is the unique ID of your end user. We support NSString from 1 to 64 characters. Common practice is to use the Apple Advertising ID (IDFA). More information on User IDs can be found here. Important! You must enter a unique user ID for each individual user. Neglecting this field will cause a significant decrease in fill rate and ad performance for your app. Find more information on User IDs and how to generate them here. We recommend requesting an Interstitial Ad a short while before you plan on showing it to your users as the loading process can take time. Before calling the load method, make sure you receive onInterstitialInitSuccess first. 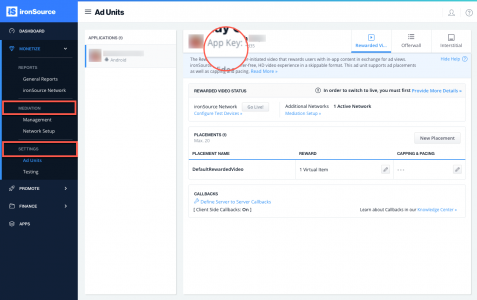 Note: If you’d like to serve several Interstitial Ads in your application, you must repeat this step after you’ve shown and closed the previous Interstitial Ad. Once the onInterstitialClose function is fired, you will be able to load a new Interstitial ad. 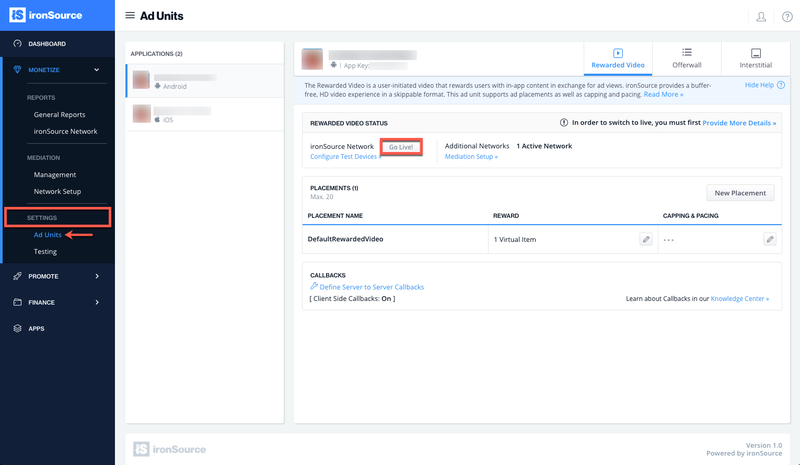 After you have received the onInterstitialInitSuccess() callback and you’ve called the loadInterstitial in Step 3, you will be notified when the ad is loaded and ready to be shown to your user. The onInterstitialReady() will inform you about ad availability. In addition to ironSource’s Ad Placements, you can now configure capping and pacing settings for selected placements. Capping and pacing improves the user experience in your app by limiting the amount of ads served within a defined timeframe. Once you receive the onInterstitialReady callback, you are ready to show an Interstitial Ad to your users. Invoke the following method on your Supersonic Instance to serve an Interstitial ad to your users.